Most people leave Triana off of their Seville itinerary – there isn’t much by way of museums or grandiose churches, and it’s across the Guadalquivir from the city’s major draws. But what the historic neighborhood lacks in monuments, it more than makes up for in feeling. Triana is a barrio that’s equal parts sevillano, capillita and gitano. 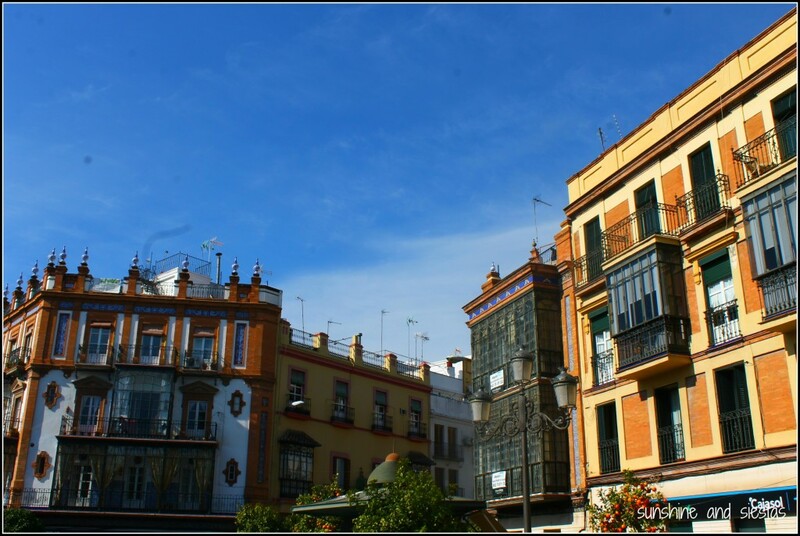 While most opt to stay in the city center, Triana is only a stone’s throw from the Giralda and Plaza de España, commanding the western bank of the river that slices the city in two. 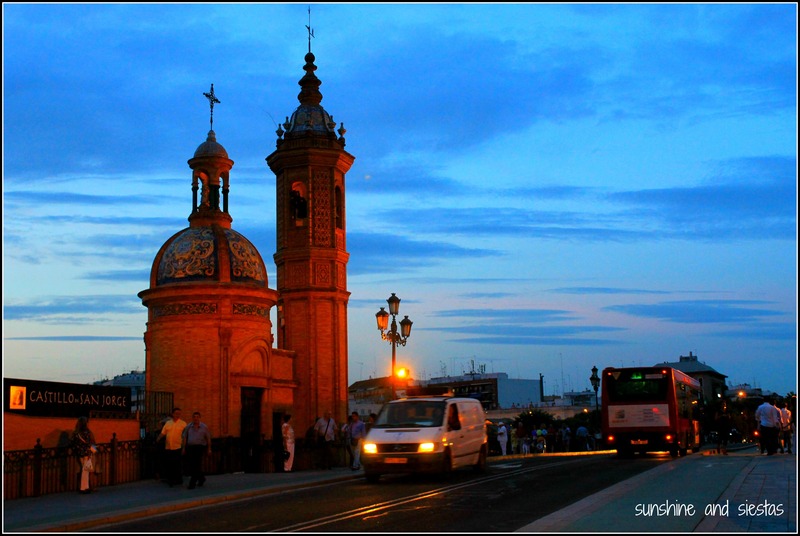 And you can feel it – Triana seems like a world away, despite being connected by bus and subway to every part of Seville. 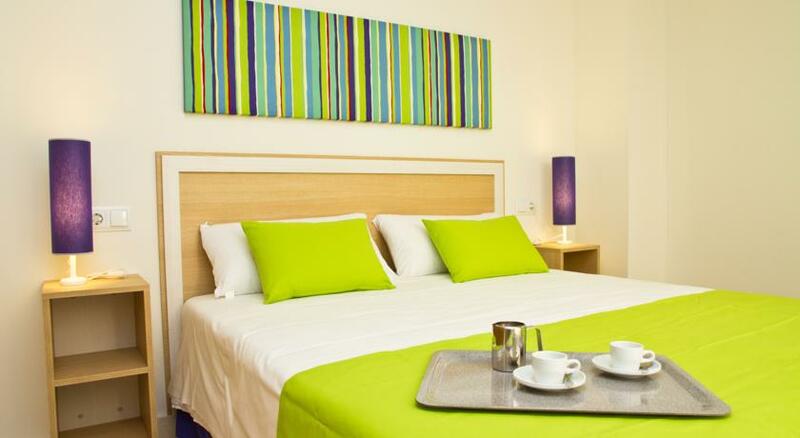 Consder an aparthotel like the comfortable and spacious ones offered by Pierre&Vacances Sevilla, right in the heart of Triana on Pagés del Coro, on your next Seville holiday. You’ll wake up to the sound of church bells from the adjacent San Jacinto church and be able to pop down to El Pulido for a tostada as long as your forearm. Historically speaking, Triana was a poor, working class neighborhood of fisherman, bullfighters and gypsies and one of the seats of the Holy Inquisition, headquartered at the Castillo San Jorge on the riverbank. Today, it’s a neighborhood known for its fiercely trianero residents, flamenco culture and tile production, and is home to several well-known bars and eateries. I may be biased, but it’s my favorite part of the city, and one whose streets I walk every day as a resident of the 41010. Many days, there’s no need to even cross the Puente Isabel II into town. If you have a free afternoon, don’t miss Triana’s charm. 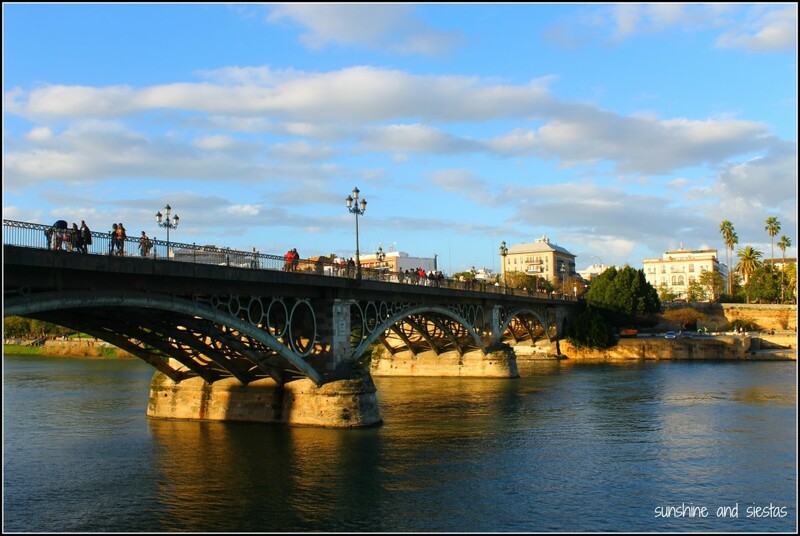 Start by crossing the Puente Isabel II over the Guadalquivir river, the official entrance into the República Independiente de Triana. The bridge was the city’s first, replacing a pontoon bridge in 1854 and built by an Eiffel disciple. It’s easily my favorite monument and the nearly official symbol of the neighborhood. At the western end, you’ll find the minuscule Capilla de Carmen, which was built by famous sevillano architect Aníbal González (you’d recognize him from the Plaza de España) in the early 20th Century. 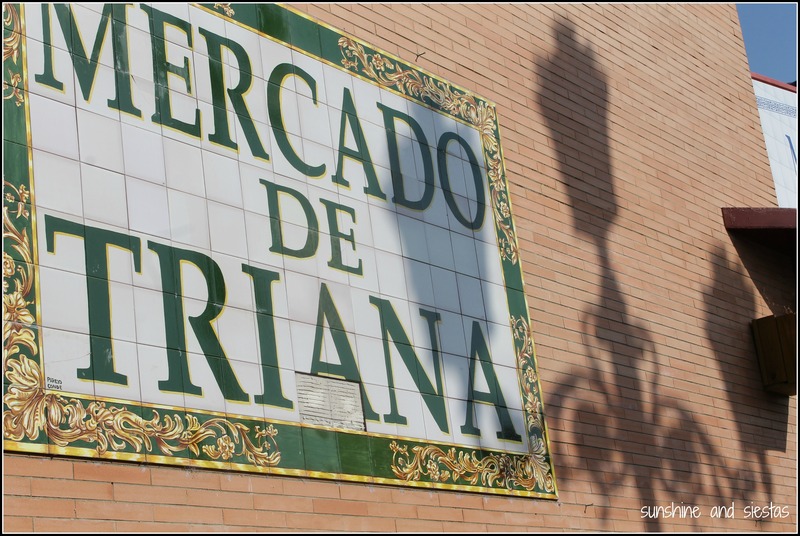 Your first stop in 41010 should be the newly renovated Mercado de Triana. Still very much a local’s market, fruit and vegetable vendors, fish mongers, butchers and specialty producers hock their wares just steps from the river. The market was built atop the ruins of the Castillo de San Jorge, visible in the adjacent museum and even in the walls of the mercado (C/San Jorge, 6). If you can’t stick around all night, there’s a small flamenco theatre flanking the western edge of the market with shows at noon on Tuesday, Wednesday and Thursday. Triana has the privilege being where the sun chooses to sleep nightly, as the famous song goes, and it lingers over the district all afternoon long. Retreat back to the Puente Isabel II and to the yellow bar that sits opposite the Carmen chapel. 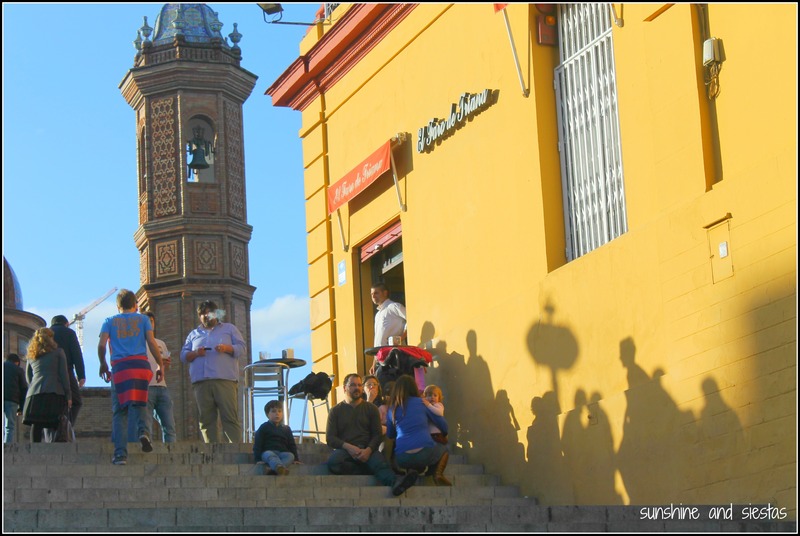 Trianeros know that the food at El Faro de Triana isn’t anything special, but the views from the terrace or even the steps leading down to Calle Betis get the most sun midday. Order a cervecita and take it outside if it’s a nice day (Plaza del Altozano, 1C). Continue walking down Calle Betis, the Roman name for the river, away from the bridge and towards the Torre del Oro. The thoroughfare is packed with bars and restaurants, though you should steer clear of them for now and walk on the other side of the road so as to avoid hawkers while drinking in the view across the river to the bullring, opera house and the Torre del Oro itself. Though 2pm is still a little early for me, it’s time to tapear, or eat, your way through Triana’s tapas bars. At the southern end of Calle Betis, stop at La Primera del Puente, a nondescript tapas bar lined with tiles and grilling fish over a hot skillet, and order just one thing: patatas bravas and a glass of Cruzcampo. In eight years, I’ve tried countless dishes of fried potatoes with a spicy red sauce, and La Primera has some of the best (even if their barman makes fun of my accent constantly (C/ Betis, 66). Backtrack to Calle Troya and head away from the river, then take the first right onto Calle Pureza. I photographed a couple’s first look photos on this street because of its colorful houses and ornate doorways, and it’s home to both Triana’s first church, Santa Ana, as well as several watering holes (C/ Vázquez de Leca, s/n). If Santa Ana is open, it’s worth a quick peek – commissioned in 1266 (yep, 750 years ago! ), Santa Ana is known for its mudéjar hallmarks and Baroque facelift after the Lisbon earthquake of 1755, whose aftershocks were felt in Sevilla. Just in front of the north facing door is Bar Santa Ana, a typical tavern featuring local dishes, like espinacas con garbanzos, bull tail and small grilled sandwiches. This is the bar I bring visitors to when I want to tell them about Holy Week, as paraphernalia of weeping Virgins and Bloody Christs adorn the walls. This is the sort of bar where locals have been locals since the 50s and where waiters still write your bill in chalk on the bar (C/ Pureza, 82). You can pop into the Basilica de Nuestra Señora de la Esperanza de Triana just down the road, a stark white chapel that stands out amid salmon, cornflower and albero shaded homes and palaces (C/ Pureza, 53). A little bit further up the road in La Anigua Abacería, a cozy, dimly lit cold cuts bar whose menu is long and has quite a few surprises. 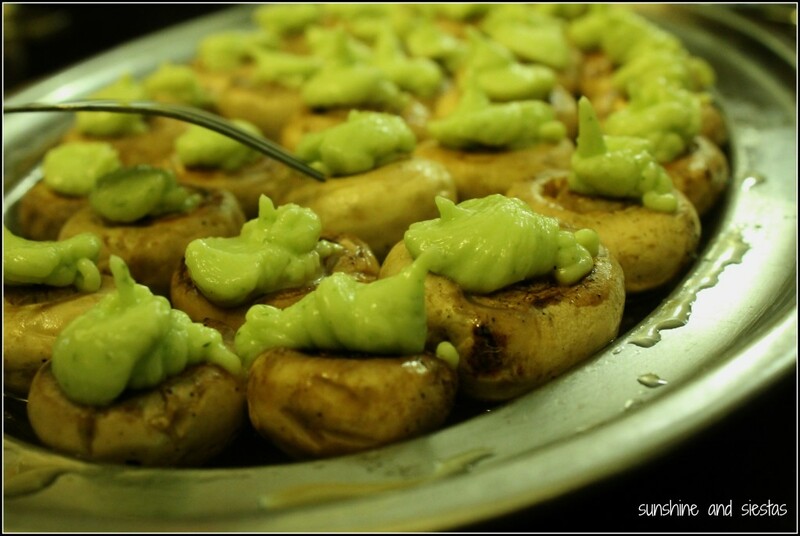 There are plenty of good vegetarian options here, too, and gobs of wines to try (C/ Pureza, 12). Once you’ve had your fill, the serpentine calles and callejones of this part of Triana are good for walking off the calories – as well as staving off the siesta. Around the corner of Calle Callao is Cerámica Santa Ana and the Centro Cerámica de Triana. The neighborhood has a long tradition of ceramics production and boasts several small shops that still make azulejos in the ancient way, though the clay no longer comes from the riverbanks. Hand-painted ceramic bowls, pitchers and magnets are my go-to souvenirs and even made them a prominent part of my wedding decoration, and Plaza de España’s elaborate tile depictions of Spain’s 50 provinces were made in factories here (C/ San Jorge, 31). If you’re not looking for souvenirs, poke around the Centro Cerámica de Triana‘s small museum, one of the city’s newest. Though the kilns are no longer operable, they can be found in the museum, which also explains traditional techniques in English and Spanish. Plan around three-quarters of an hour (C/ Antillano Campos, 14). 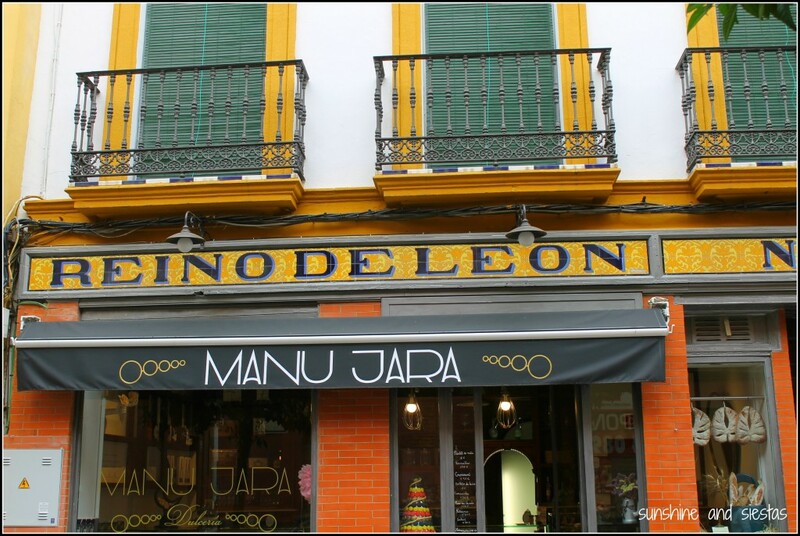 Head back to Calle Pureza and straight to Manu Jara Dulcería, a pastry shop owned by a French chef of the same name (and did I mention his Michellin stars?). While his brand of desserts, MasQuePostres, aren’t made on-site, they’re fresh, delectable and the shop itself a treat (C/ Pureza, 5). Sevillanos usually take their sweet afternoon snack, called a merienda, with a coffee or tea, then follow it up with an adult beverage. Around the corner, back on Calle Betis, sits La Tertulia, a watering hole that plays off of the famous political and social discussion groups of the turn of the century. Avoid heading inside for anything more than ordering if you can – the bar smells like dirty pipes and mold – and grab a seat along the bench with your mojito. You’ll be rewarded with the same views you had before lunch, just this time as night falls and the Triana bridge lights up (C/ Betis, 13). Triana is known as one of the liveliest neighborhoods in the city, and as night falls, bars and restaurants again fill with patrons. If you’re not hungry just yet, have a beer at Cervecería La Grande back on San Jacinto (C/ San Jacinto, 39). Back when the Novio and I started dating, we’d have a routine called the ruta trianera, in which we’d have a few beers at La Grande before popping around to different bars in the area for dinner. Begin at Bar Casa Diego on Alferería (5). Don’t expect an English menu here; order a heaping media ración of pollo frito, friend chicken, and one of croquetas de puerros, or leek croquettes. Local lore states that Diego’s wife grew so tired of making béchamel and rolling croquetas for hungry clientele that she up and quit in the middle of a shift! Walk around the corner on Antillano Campos to Las Golondrinas I, a Triana institution and at the top of my list. The micro kitchen produces just a few dishes, and tapas are only available at the crowded bar. Ask Pepe for a glass of house wine and a tapa of punta de solomillo, a piping hot pork loin sandwiches, and champiñones, sautéed mushrooms crowned with mint sauce (C/ Antillano Campos, 26). If you’re still hungry, Paco España has big plates of food to split, most notably their open-faced sandwiches, called panes (C/ Alfarería, 18). 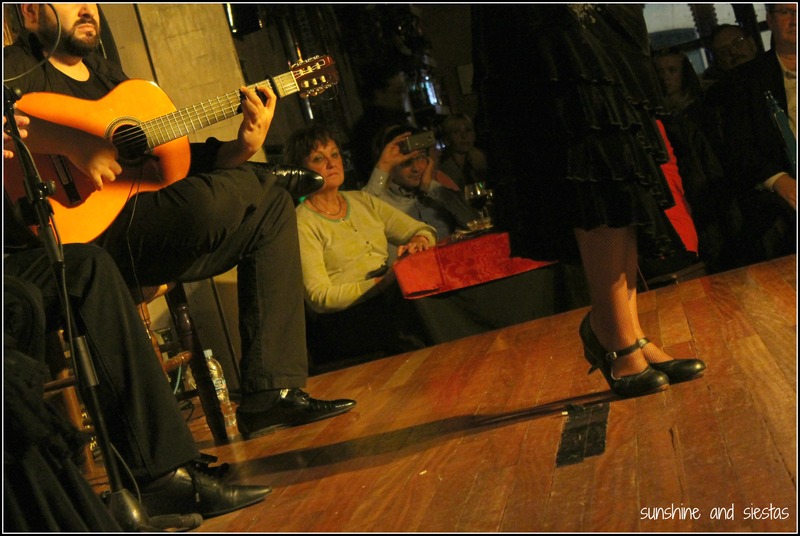 Though I’m not a huge fan of the boisterous woman whose name and large presence give Casa Anselma her name, the flamenco bar is hugely popular with locals and tourists. Passing down Pagés del Coro, you’d never expect to find a bar behind the aluminum gates at the corner of Antillano Campos (49), but between 11 and midnight, Anselma opens her bar to patrons for impromptu flamenco shows. Just be sure to count your change – though there’s no cover charge, drinks are twice as pricey here. Bonus: looking for different food and drink options? There is no shortage of good restaurants in this part of town, from bars that resemble a closet to restaurants that have garnered top foodie prizes. Pura Tasca – One of Triana’s first gastrobars was built into what was once a butane tank distributor. The decoration evokes a storage space, but the rotating menu and top-notch wine list are always on (C/ Numancia, 5). Bar Juan Carlos – Cheese and craft beer, and little else, the small bar is usually packed in the evenings. You can order samplers, cheese skewers and fondue, and there’s a beer of the month selection on offer (C/ Febo, 6). La Fábula – People spoke so often of La Fábula that even the Novio, a creature of habit, wanted to try it. Spanish favorites with a twist are the hallmark of the pub, which bills itself as a gastrobar and has a few local craft beers on offer (Ronda de Triana, 31). Casa Ruperto – known to locals as Los Pajaritos for its signature dish, this typical cervecería roasts quails on a spit. They’re also famous for their snails in tomato sauce (cabrillas) (Avda. Santa Cecilia, 2). Jaylu – I’ve never eaten at this renowned seafood restaurant, but it’s purportedly one of the city’s best (López de Gomara, 19). Sala El Cachorro – Started as a playhouse, the eclectic space soon morphed into a cafetería and bar. Grab a slice of carrot cake and a coffee and sit in the outdoor patio, full of plants and sculptures (C/ Procurador, 19). As always, be sure to check opening times and dates. You can reach Triana by metro (M: Plaza de Cuba and Parque de los Príncipes) or bus (5, 6, 40, 43, C1, C2), or simply walk from the city center. 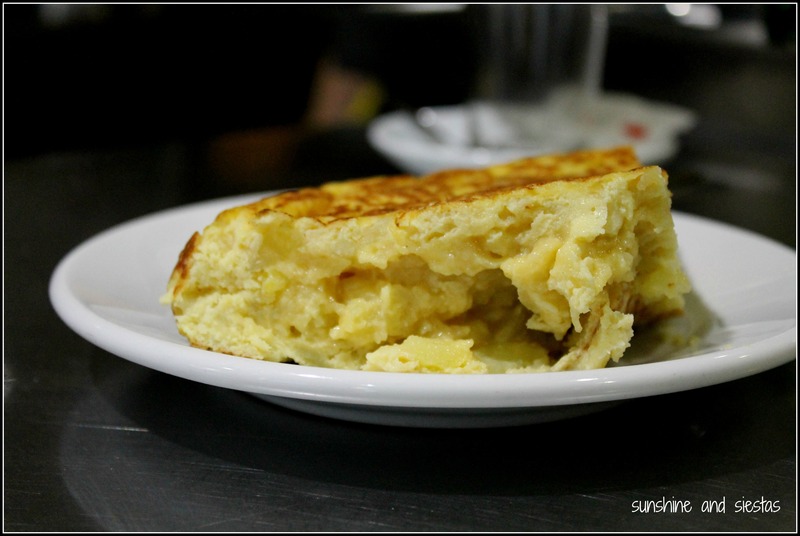 This post contains an affiliate link to Devour Tours’ wonderful Tapas Like a Local – Triana tour, which I have had the pleasure of walking! You can click at no extra cost to you. 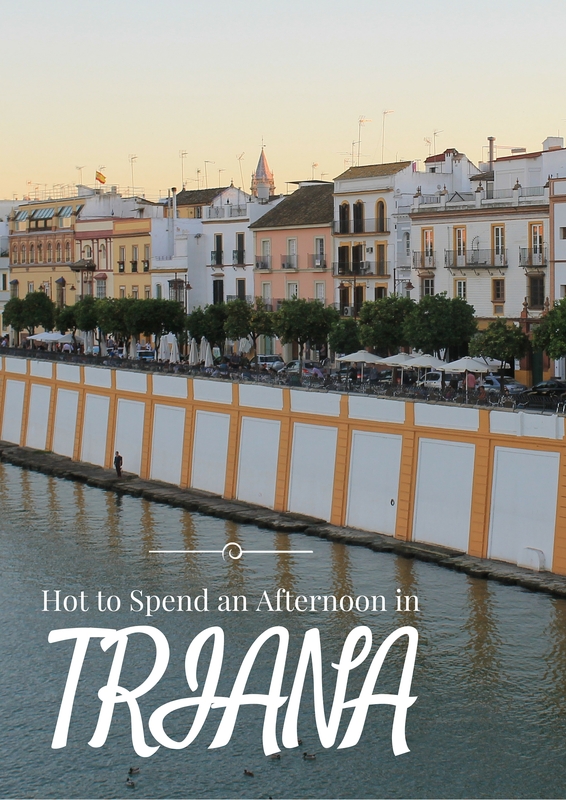 Have you ever spent time in Triana? What are your favorite places to eat, drink and visit? If only we’d had more time! It was great having you! LOVED this. I lived in Triana with a host family when I studied in Spain back in college. Everyday I crossed the Puente Isabel II to go to classes that were in the Arenal barrio. I liked the location of my host family’s flat as it was right off Calle San Jacinto so I could easily walk (I had some friends who lived in Triana a lot further back and they took the bus). This looks like a great neighborhood full of culture and great food! 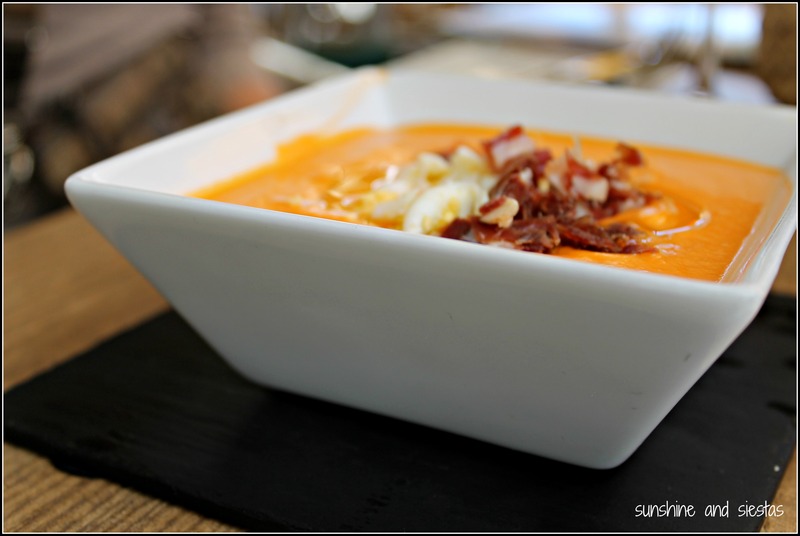 Love the idea of fondue at Bar Juan Carlos! I love learning about smaller, lesser-known neighborhoods in famous cities! I’ll definitely have to check out Triana when I FINALLY get to Seville. Oh my goodness! I want to book a ticket now. I went to Barcelona and there’s so much more that I want to to see in Spain that it definitely feels like I need to move there with the family for a year. I love towns that don’t have all the tourists attractions where people just live! I recommend also https://www.genteel-home.com/ for the accomodation, we spend a really nice time thanks to them !! The patatas at La Primera del Puente we’re so bad, they made me a little angry. Felt like an uninspired tourist trap with staff just going through the motions. Over-priced. Well, this is disappointing! I did have one waiter laugh at my accent but it’s disheartening to know that the quality has taken a dive. 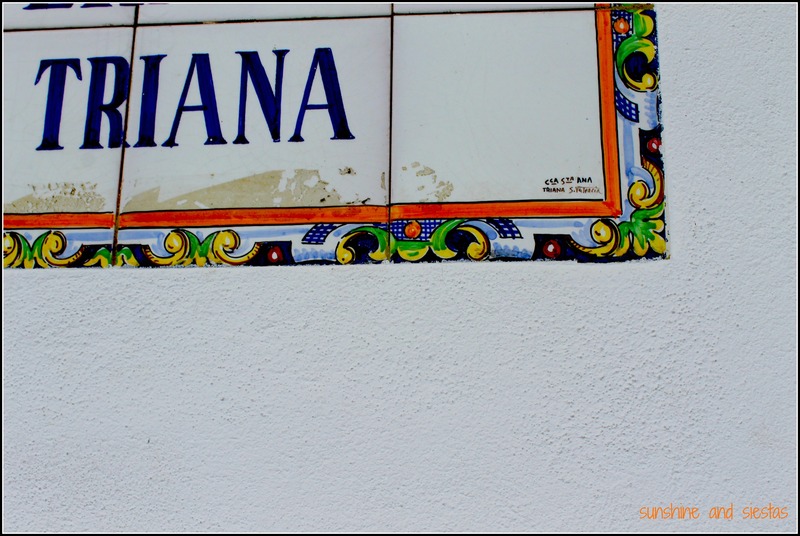 Thank you so much for writing such a detailed, colourful guide to Triana. It’s going to be my first trip travelling alone but with an informative itinerary, I feel more excited than not. Your writing demonstrates clearly how much you know and love the area– thanks again for sharing! Thanks, Nancy. Triana truly is my home (even though I live elsewhere in Spain). Enjoy your trip! Hey sunshineandsiestas, thanks for the tips! Would have to disagree with you about the patatas bravas, definitely not the best you can get in seville, but the setting of the cafe is very nice. Hi Miguel, I love bravas (and am spoiled in Madrid!). 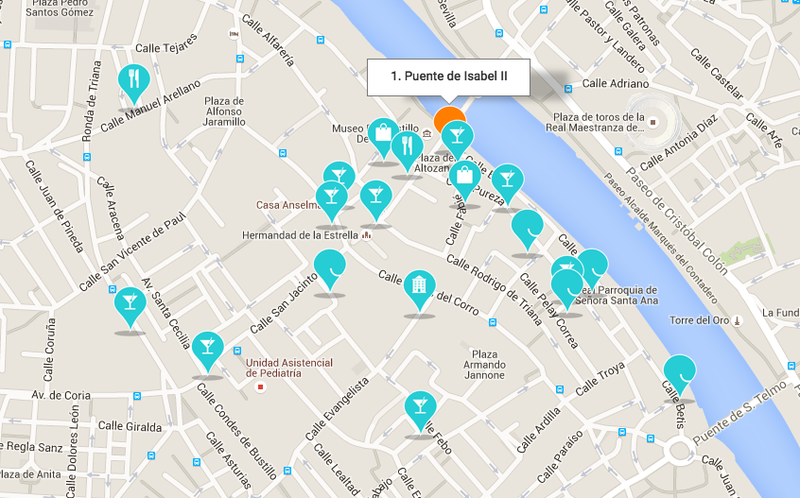 Where are your favorites in Seville? Hi. We have been in Triana on July. But sadly we only sleep there we barely had time to explore the neighborhood. Luckily our apartment’s owner suggested us Las Golondrinas. The Food was very good and I’ll recommend it too. Thanks for the post it is very good and makes me desire to explore more. It’s my favorite place! I’m glad you had the chance to see a small snippet of Triana. Hapy trails! I’ve made note of everything you wrote and am using this to plan a full day in Triana in October. I’m planning on going on a Sunday, hopefully everything will be open. Thanks so much for sharing! I’m so excited! Hi Nikki, you will find some closures but eateries should be open! Have a great time! My partner and I from Canada are staying in Seville for 2 weeks in January 2019. Thanks for your information and we definitely intend to follow your recommendations!